Today is the religious celebration of Ahoi Ashtami in India. In Hinduism, this ritual of keeping fast by mothers for well being and long life of their sons which is popularly known as ‘Ahoi Ashtami’ that falls on 8th day of Kartik month every year is the most important ritual in Indian culture and religion. This not only shows immense love and affection of mothers towards their sons but also tends to keep the families joint and united by filling the thoughts of respect and regards by sons for their mothers. This is unique tradition in India as no other country seems to have such tradition. There is a story behind this most important ritual in Indian culture and religion. There lived a woman with her seven sons and one day she went to forest to bring some soil to plaster the floor of house. While she was digging soil in the forest, she unfortunately and unintentionally killed a small cub like creature. She felt unhappy and sorry over this incident and came back to home. After this incident all of her sons died one after another within a year. The woman started believing in her heart that her sons died due to her sin of killing that cub. One day she narrated the incident of her killing of that cub to some wise ladies in her neighbourhood. Upon hearing the story of that woman, they advised her to keep fast, confess and pray the Almighty Goddess Ma Bhagwati by making a picture of that cub on the wall on 8th day of Kartik which would redeem her sin of killing the cub. The woman kept fast on that day and prayed the Goddess as was advised by making a picture of that cub on the wall and after some time the Goddess blessed her with all of her seven sons. Since then, this tradition has become a ritual amongst the Hindu mothers to worship the Almighty Goddess Ma Bhagwati by keeping a whole day fast and praying the Almighty Goddess Ma Bhagwati in the form of picture of cubs made on a wall of house for the well being and long life of their sons. Really the tradition is filled with immense love and affection between mothers and sons. On this day Hindu mothers make pictures of cub(s) on the wall of their house or hang pictures of Ma Bhagwati on the wall and pray Ma Bhagwati as shown in the picture. For the long life of their sons, they also wear a necklace of silver beads around their neck. Two silver beads are added every year in this necklace of silver beads for long life of their sons. 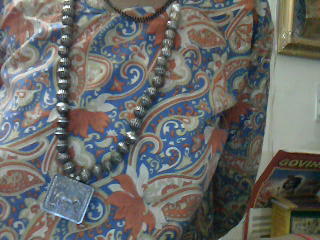 Mothers keep on adding these silver beads until they die. 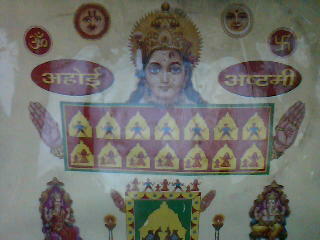 In the day time, women/mother gather and listen to the story of Ahoi Ashtami with great devotion. In the evening they pray Goddess Bhagwati and then also pray stars for the long lives of their sons. After that they give food to the eldest lady in the house or if there is no elder lady in the home, they give food to some other elderly woman in the neighbourhood or in the temple. After that only they eat something to break their fast. It is really a unique tradition in India only to cement the bonds of love and affection between mother and son. Dussehra is one of the most popular and one of the most celebrated festivals of India which is celebrated with great fanfare, joy and enthusiasm. In India as per local calendar it is also called Vijaydashami being falling on the 10th day of Ashwin month (in English Calender this month falls in September-October every year). This festival is celebrated in memory of victory of good over evil and also victory of truth over untruth. Before Dusserah Indians celebrate Navratra which literally means Nine Sacred Nights and during these Nine Sacred Days/Nights all Hindus worship Goddess Ma Durga and hence these nights are known as Navratras. According to Hindu mythology, Lord Rama, the eighth of the twenty four incarnations of Lord Vishnu killed Ravana or Dashanan (a demon having ten heads), the king of Lanka (now known as Shri Lanka) on the Tenth Day of their battle in Satya Yug (the age/period four five thousand years ago, in which Lord Rama reigned over people and everybody was properly looked after and taken care. We have the concept of a welfare state from Lord Rama’s period) and rescued his wife, Goddess Sita from the clutches of Ravana. Hence that day of victory is known as Vijayadashami or the Victory on the Tenth Day. This day is also celebrated and is important for another mythological incident. It is also believed that on this day the exile and banishment of the Pandavas came to an end which connects this day with another age of Mahabharata where Lord Krishna, the 10th incarnation of God came on the earth. 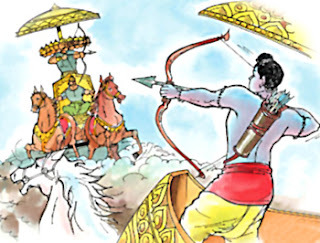 The Pandavas defeated the Kauravas (hundred sons of King Dhritrashtra who symbolise evil and grabbed the kingdom of the Pandavas after defeating them in gambling with cheating). As such Hindus worship their weapons etc on this day to mark the greatness of the day which symbolises victory of Good over Evil. This day is also auspicious as it commemorates the legend in relation to Goddess Durga, known by various names in entire India like Ma Chamunda, Ma Kali, Ma Vaishnau, Ma Sheronwali etc. The legend is this that Goddess Durga killed the deadly demon Mahishasura on this tenth day after a continuous fight of nine days. Hence this day of Dussehra is marked as the day of victory good over demonic powers. It is an auspicious occasion for men, women and children to commence their ventures, education, learning in classical dance and music and to pay their respect to their elder ones. In southern part of India, during these nine days before Dussehsra, first three days are dedicated to the worship of Lakshmi, the Goddess of Wealth and Prosperity; the next three days to Saraswati, Goddess of Learning and Arts and the last three days to Shakti, Goddess of Power and Might and the tenth day is marked as symbol of victory over evil. In India, Dussehra of Kullu (in the state of Himachal Pradesh) is well famous where not only thousands of people take part for nine days but also it is believed that Gods and Goddesses take part. People from all over the world gather there to be part of this celebration there. Similarly in South India, Dussehra of Mysore is celebrated in a grand style by the Royal Family of Mysore. Dussehra is so famous in Mysore that it is known as the State Festival of Mysore in Karnataka. During the festivity of Dussehra, the entire atmosphere is colourful. People gather in the open play grounds to enjoy a lots of live performance of folk and traditional artists, to watch spectacular short acts on the lives of Lord Rama and Ma Durga and others. There is also a stunning display of fireworks all around in the evening before the effigies of Ravana, Meghnath (Ravna’s son) and Kumbhakaran (Ravan’s Brother) are burnt amidst a great crowed of people. If anyone gets a chance to be in India during Dussehra festival don't miss this fascinating festival and try to understand the hidden meaning behind this festival which marks brotherhood, peace, prosperity for all. Wishing you all a very very happy and prosperous Dussehra !